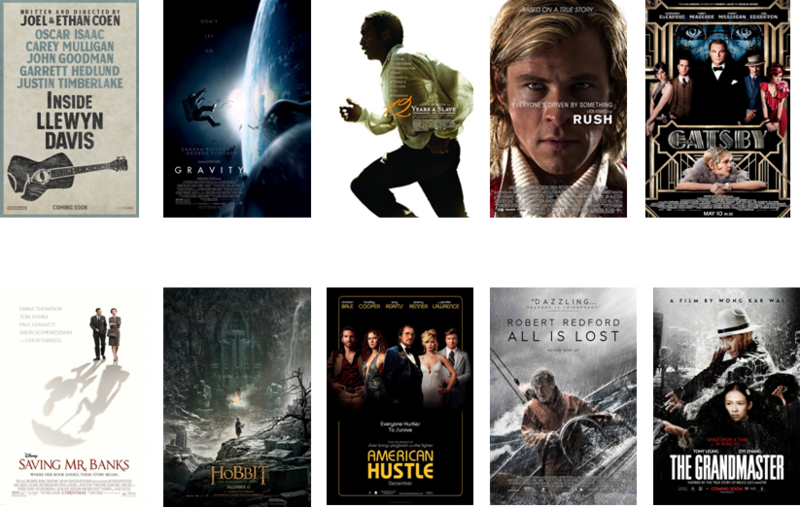 The rundown: This category is friendly to epics and fantasy films, though I’m not sure how much that will apply this year. Inside Llewyn Davis seems like a good bet to join Gravity and 12 Years a Slave, and this is also a likely spot to recognize both Rush and The Great Gatsby. The first “Hobbit” film made the cut last year, so The Hobbit: The Desolation of Smaug could be nominated if voters want to continue honoring that series. Otherwise, it’s anyone’s guess, whether it’s a period film like Saving Mr. Banks or American Hustle, or a grander visual undertaking like All is Lost or The Grandmaster. One possible crazy scenario: Something like Man of Steel manages a mention. Forecasted winner: My guess is The Great Gatsby if it gets nominated.